What a difference a bit of daylight makes inside the workshop! Just in case you haven’t figured out what I’m saying ;-), my first order with TLC-Direct arrived yesterday, as promised. It’s great that they can makes such ‘Fragile‘ items available for local delivery. What I found even more gratifying was that my order arrived complete with the two 3ft tubes I was previously informed were temporarily out of stock – I highly recommend this company and the addition of daylight fluorescent tubes to your workshop. Now, I did take a few shots to try and demonstrate the new look but, I’ve now decided to include a Workshop Tour page at some point in the next couple of weeks (or, at least, that’s the plan). Disc sander in its new home - situated on top of my lathe! First up, I’d like to announce that my Hegner disc sander has a new home. For the last few weeks, I’ve been toying with the idea of trying to sell it and instead knock up a disc sander-attachment for the lathe, as I’m so short on space and this sander has so far been tucked in behind my mortiser and dust extractor; very awkward to reach when I need to use it, even for a quick job. 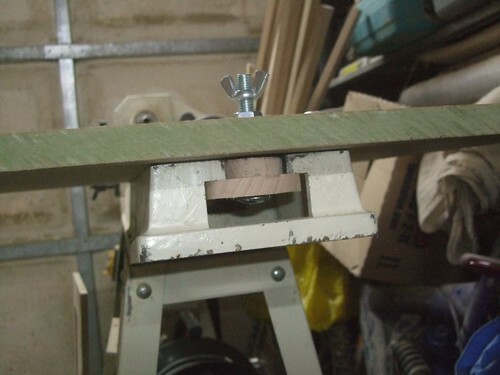 So, as I don’t use my lathe that often, I came up with the idea of mounting it on top. This actually works very well for mean and does mean that, after I purchase my new workshop vacuum, I’ll be able to hook it up to with dust extraction for the first time in months! No, it's NOT an Axminster TS200!! In order to mount the supporting table to my lathe, I copied the same ‘mechanics’ used to hold the tool rests and and tail stock in place, making them out of wood. It does lock very securely in place and can be positioned along the length of the bed. When I next need to use the lathe, all I need to do is to remove it in one and dump it on my workbench until I’ve finished ‘turning. Only downside so far is that it requires a spanner to tighten the nuts (the wing nuts are there for added security, really). But, as I don’t do a lot of ‘turning right now, this is still very convenient for more. Plus, it frees up more space on top of the chest freezer for dumping tools and using the mortiser. Very briefly, I did even consider purchasing this small table saw and trying to set up alongside or in place of the sander on the lathe… But, I’m trying to remain strict to my own rules here; I decided some time ago that, if I didn’t have room for a larger table saw then, it’s not worth trying to squeeze one in when I could do most of the required work with a bandsaw or hand-held circular saw (it just takes a little bit longer). 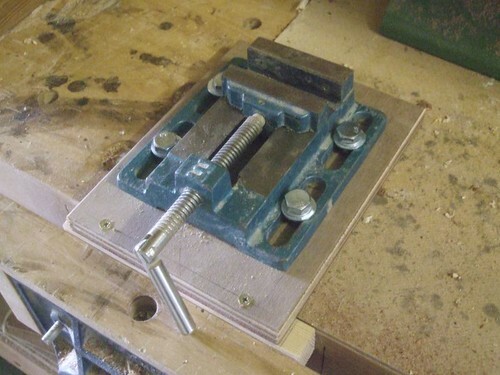 An easier method of securing a small vice to your workbench. To end today’s update, here’s a photo of something I’m been meaning to do for so long! My drill press/pillar drill vice has finally been converted in something akin to a metalworking vice (…well, actually, all I’ve done is making it easier to hold it in the vice). In the past, I used to clamp this to my ‘bench top where G-cramps would almost always get in the way. That shouldn’t be an issue any longer! Having completed a Chest of Drawers only a few days ago, I’ve now got my sights set on another Dining Table; this time, for my mother. Most of the beech has been cut and I’m almost ready to start machining. Having sawn a few fresh pieces today though, I’ll need to give it another couple of weeks so the timber can acclimatise. In that, I intend to finish a couple of odd-jobs around the workshop and may even make a start on some of my smaller entries for the local exhibition (which is now pencilled in for March, or so I’m told). Reading a few other woodworking blogs on WordPress (which is where I got the idea for a Workshop Tour page), I may have to start a To-Do List as well, so I can stay on track and keep on top of things! 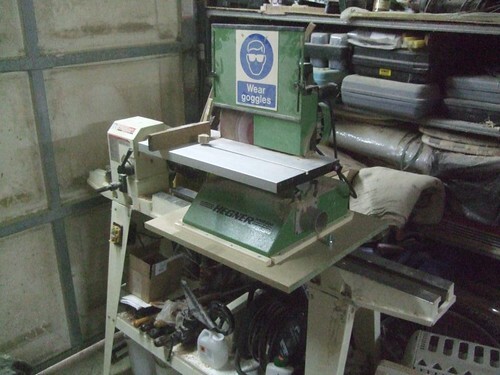 Right now, I’m looking to get my new~old mortiser up and running (among others things) – for which, I’ll keep you posted!